Play with the traffic n get dead. Good plan! Gotta luv a diehard roadie! Indeed some do but surprisingly few. Anth_F wrote: Play with the traffic n get dead. Good plan! Lee Martin, who was killed by the texting van driver, was a mate of mine. mickyduck wrote: Im exactly the opposite.. I use the C2 because it is "good" for me but cannot get away from counting strokes and distance so mentally it is tough,, on the other had I find my TACX interactive trainer totally entertaining and often(almost) forget Im just pedaling in my spare bedroom. I think the fact that the erg is more challenging mentally is what keeps my mind occupied and saves me from boredom (compared to the stationary bike). I also count strokes, but only for the last 200-250 meters of a piece, when I'm beat and really want to force myself to bear down. Been looking for a good indoor training bike and wasn't impressed with what was on the market. Was looking at the impressive Wattbike but the $$$$$ is nuts. I ride outside anytime in the winter. But often can only hack it for less then 2 hours and after work in the dark fall/winter was limiting. BikeErg will take up a small footprint compared to my Kurt Kinetic setup now. Looking forward to the accessibility and good measurement of the work i'm doing on the bike. Will also be able to fit in nice quick interval workouts when i have limited time. Love the Concept2 came out with this. Honestly thought i was dreaming when i saw it on Monday. I've been rowing almost daily since November 2016 and got to say I do love it, and when I saw this new BikeErg on Monday I was over the moon as cycling, or "spinning" is something I've been looking at starting for the last couple of weeks, mainly for the variation. 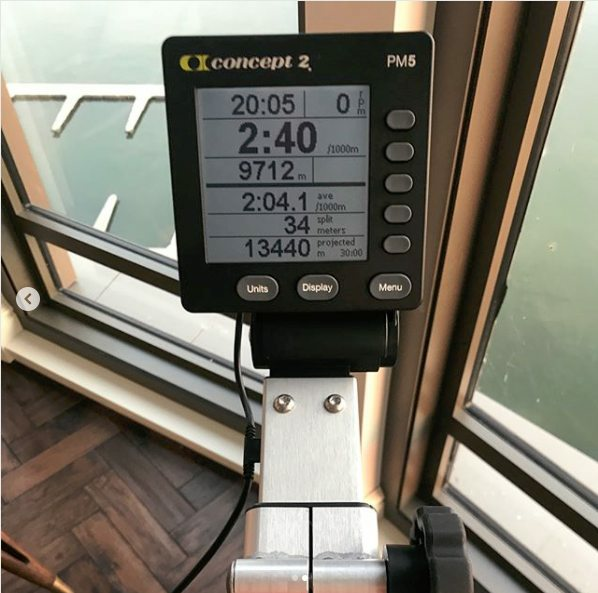 Anyway my question is, if rowing 5k in 20 minutes is hard but not impossible, what distance should you expect to cover in 20 minutes of cycling at the same level of effort? Rowing almost daily since November 2016 and have built a very strong love/hate relationship with my erg. The greater majority of club cyclists are capable of 16-20mph average on flat roads with few stop signs or traffic signals and calm or light wind conditions. Takng 18mph as reasonable, expect 6 miles (10km) in 20 minutes or roughly twice the familiar 5k benchmark of "virtual" distance in indoor rowing. An apples to throw rugs comparison of course as 20' 5k erg is considerably harder than 10k bike ride in 20'. jackarabit wrote: The greater majority of club cyclists are capable of 16-20mph average on flat roads with few stop signs or traffic signals and calm or light wind conditions. Takng 18mph as reasonable, expect 6 miles (10km) in 20 minutes or roughly twice the familiar 5k benchmark of "virtual" distance in indoor rowing. An apples to throw rugs comparison of course as 20' 5k erg is considerably harder than 10k bike ride in 20'. Like the idea, don't like the placement of the flywheel. I sweat buckets and would have the flywheel covered in salt and rust in a couple of weeks of use. I do like the idea of have the same consistent data. Just wonder how the monitor will display the pace? MPH/KPH? If so how is that determined and how or will the drag affect that? Higher drag= more power at all speeds? kini62 wrote: Like the idea, don't like the placement of the flywheel. I sweat buckets and would have the flywheel covered in salt and rust in a couple of weeks of use. drag would be the same as the concept2 , which has nothing to do with power.